Having beaten Portugal and Ghana between them in the opening round of games, and got a point against the Europeans and Africans in the second, a draw would be enough to take both teams through. Thankfully the suggestion of an agreement between the German coaches akin to the 1982 game between West Germany and Austria didn’t come to pass, with both teams looking for the win. Joachim Low brought back newly-fit Bastian Schweinsteiger and Lukas Podolski at the expense of Sami Khedira and Mario Gotze, while Jurgen Klinsmann replaced Alejandro Bedoya with Brad Davis. The game was played to the familiar pattern we have come to expect from these two teams so far. The United States’ problems in retaining the ball was highlighted further by the fact that this Germany side is clearly influenced by the tiki taka style of Pep Guardiola, treating possession as an endgame in itself. The US mainly looked to attack quickly when they finally won it back from the Germans, with full-back Fabian Johnson once again proving an excellent outlet on the right, taking advantage of Benedikt Howedes still looking out of his depth away from the centre. 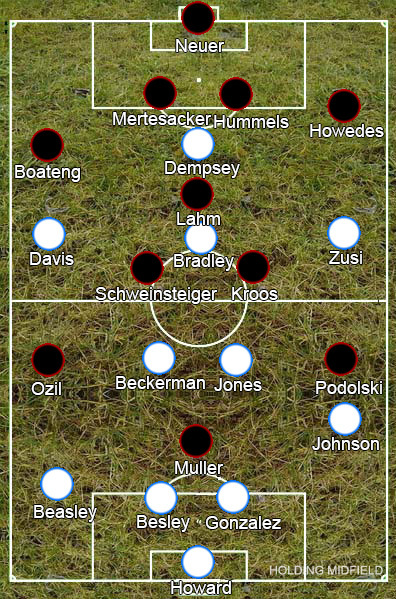 Nevertheless, it was Germany who had the majority of the ball and with it controlled the attacking of the game. Jerome Boateng was getting forward particularly well, but he frequently had no one to aim towards. Thomas Muller’s drifting role meant he played a part in build-up play, yet wasn’t actually in the box to finish, while Schweinsteiger would drop off to the left of the centre-backs to pick up the ball, rather than bursting forward as Khedira would, and Podolski was anonymous. The American defence’s organisation was bad again – the gaps between full-backs and centre-backs too large and Matt Besler dragged out easily – yet Germany had little interest in actually attacking these areas. Miroslav Klose was brought on at half-time – an intelligent player capable of great teamwork but wanted here for the poaching abilities that have seen him equal Ronaldo’s World Cup scoring record. They weren’t needed though: Muller scored following a set play ten minutes later and the game petered out, with the result of the other game ensuring the United States’ survival. Germany top the group, but they do it as a poor imitation of Spain’s golden generation at their least interesting. Lahm doesn’t look comfortable in the holding role for this team, Howedes isn’t a capable left-back and Per Mertesacker’s lack of pace looks a problem. Their possession play is a good idea to tire the opposition in the Brazilian heat, although it has to actually go somewhere – at the moment it’s sterile and boring. Presumably, the US will face Belgium in the next round and, despite their issues, should be a good bet to beat a presently underwhelming team.